Our NL1270 is a popular, lightweight, non-toxic, non-marking, crystal clear hose that is suitable for air, water, glue, mild acids, potable water, and food or beverage transfer (meets FDA, NSF, 3A and USDA requirements & is CFIA approved). It can also be used as a light vacuum line on packaging machines or as a feed line on carpet-cleaning equipment. We also offer a solid coloured cover PVC hose NL5050 for applications subject to algae growth or UV degradation where the clear properties of the NL1270 are less desirable. Construction: Tube: Very smooth, clear PVC. 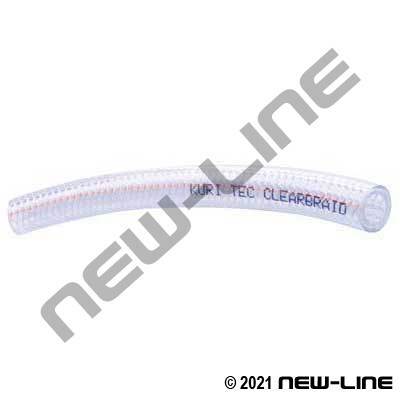 Cover: Smooth, clear PVC. Reinforcement: Polyester yarn with a longitudinal orange yarn for identification. Detail Comments: Some sizes also available in 100 ft retail display coils.